Romance with a twist. Make her dream engagement proposal unique and memorable. With this gorgeous twisted halo round diamond engagement ring you will surely get her on the way to the aisle. This Double Halo Twisted Shank Engagement Ring glimmers with beauty, adding a true hint of elegance and love. Imagine that beautiful smile you get when you give this diamond ring to her. The goal is plain and simple. You want to make her feel special and make this special day very memorable. It is a dream to own an engagement ring. When a woman dreams of special presents from a love one, it always pictures having a diamond jewelry. 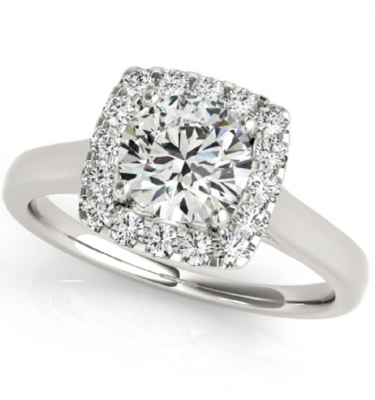 This ring exudes elegance and brilliance. Each stone is breathtaking.The ring symbolizes not only of beauty but also class and sophistication. Not only would she feel so special, she would also feel so loved. Show your love, trust, and loyalty. Say it with this diamond ring.